Catalan is the language of Catalonia. It had evolved from the common Latin before the ninth century and belongs to the western branch of the Romance languages. The linguistic domain extends over an area of more than 68,000 km2 in four different states: Andorra, Spain (in Catalonia, Valencia, the Balearic Islands and eastern Aragon), France (Département des Pyrénées Orientales) and Italy (in the city of Alghero in Sardinia). How many people speak Catalan? About 10 million people speak Catalan actively and about 12 million understand it. It is the 9th most spoken language in the European Union. Do people also speak Spanish in Catalonia? Catalan and Spanish are official languages in Catalonia and most of the people are bilingual. They are both taught at school and people can use them indistinctively when dealing with public administration. In the Val d’Aran region (the north-western corner of Catalonia), the official language is Aranese (Occitan dialect) and Catalan and Spanish are co-official. Catalan is the only official language in the Principality of Andorra. It is also official alongside Spanish in the Valencia region (under the name of Valencian) and in the Balearic Islands. In the Catalan-speaking area of Aragon, there is no legal status for the Catalan language but some city councils and institutions do recognise it. 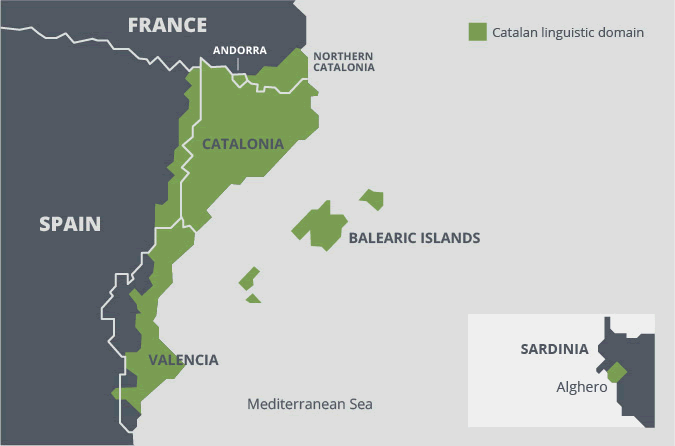 In the French territories where Catalan is spoken, it has a merely symbolic official acceptance. In Alghero, Catalan is recognised in Sardinia’s Statute of Autonomy. Is Catalan recognized by the EU? Although the Catalan language is spoken by 10 million Europeans, it is not on the list of the 24 official languages of the EU. Is Catalonia a multilingual society? Catalonia is a proud and inclusive multicultural and multilingual society. More than 200 different languages are spoken on the streets of Catalonia, from Abron to Zapoteca. In its drive for multilingualism, the Catalan Government has recently rendered it necessary to demonstrate an intermediate level of English, French, German or Italian to get a university degree. The Catalan version of the Wikipedia was created just after the original in English and is currently at 17th position in the ranking of articles published by language. 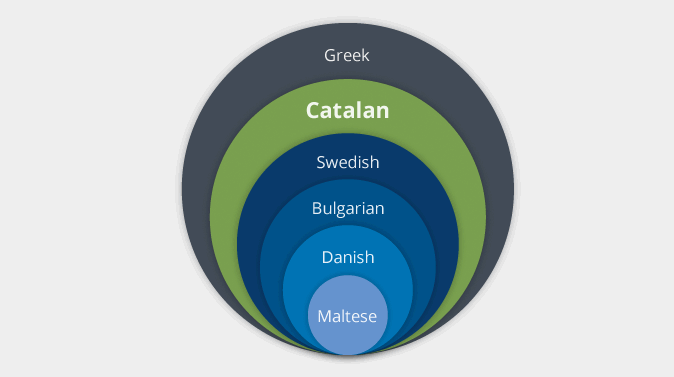 In addition, Catalan is the 8th most used language on the internet and the first to have its own internet domain: .cat. Occitan is spoken in some regions of France and Italy but only has official status in Catalonia, in the Aran Valley. Barcelona is the capital of publications in Spanish, being the city where the largest number of books in this language are published. Where can you learn Catalan?